The option of custom work by Mokuzai, allows you to have exactly what you need for your specific space and function. 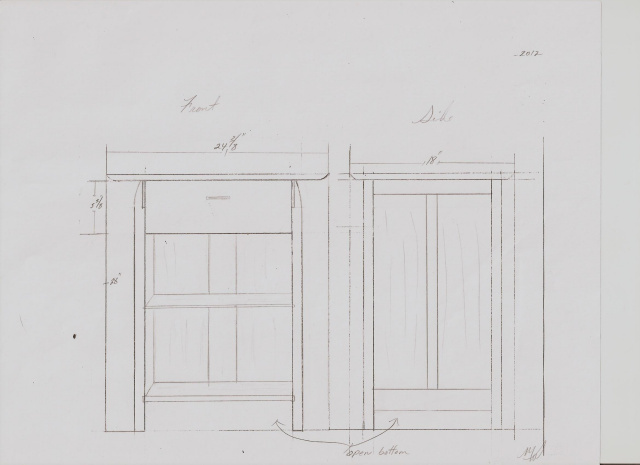 Using the comparably sized and styled piece of furniture, any adjustments to the width or height of our standard catalog pieces can be made with little or no change in price. This option does not apply to some of our cabinet/case pieces. Just use our Custom Order Form to submit your design specifications. If your space or needs for function require something beyond our standard collections, we also offer Custom Furniture Design. 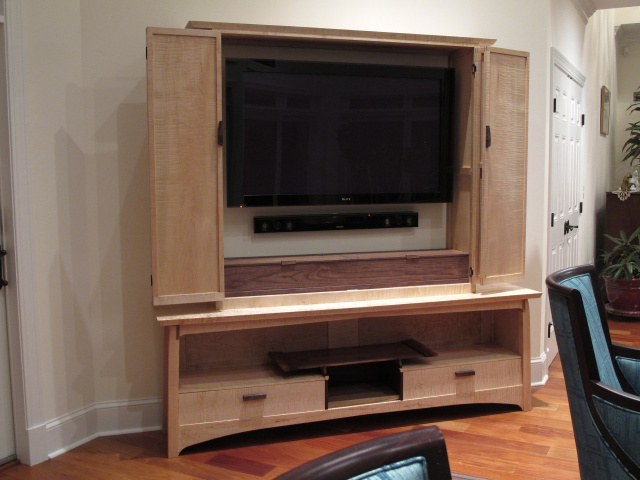 This grand television armoire was custom created from Tiger Maple with Walnut Accents. Inspired by the Tiger Maple Sofa Table and Display Cabinet, this customer wanted a work of art that would functionally suit as their entertainment center. The perfectly matched doors, accordion fold out to reveal the television behind, while still artfully framing the piece. Notice the use of the grain in both horizontal and vertical manners to properly balance the piece. Including 60 dovetails and over 180 pieces, fine hand-cut joinery ensures generations of life for this piece. Approximately 81.5"w x 81.5"h x 12"d and 18"d.
To proceed with your custom project we first start with passing some ideas back and forth. We usually ask that the customer let us know what they want. Tell us about what kind of pieces you are looking for and what function they will serve. Let us know about any dimensions you have in mind for your pieces as well as details about the space they will fill. The information about the space/room is important when it comes to making sure your new pieces will fit not only in the room but also through the doors to get into the room, sometimes details that can be overlooked until delivery. Any pictures of the room or pictures of particular things you have seen that you like are always welcome. Do you already have a particular wood choice in mind? (walnut, cherry or tiger maple) Please take some time to look through our website and let us know if there are particular details like joinery or shapes that interest you or a particular piece that really catches your eye. We like to get a good idea of what you like and what you are looking for. We then take all of this information and interpret it into a Mokuzai design. We will send a sketch of the new design as well as a quote for the completed project, back to you for review. You can then let us know about any adjustments or new information. If you are interested in proceeding with your order, we can do another sketch adjusting as needed. We prefer to handle this mostly through email so no details get forgotten through conversation. That's not to say you shouldn't call, please feel free. The price of a custom sized design will vary based on the difference in the amount of materials used. Use our Custom Order Form to tell us about your ideas. You can also email us at info@mokuzaifurniture.com or call (434)981-1340 Monday-Friday 11am-6pm EST and we will be happy to assist you with a custom order.